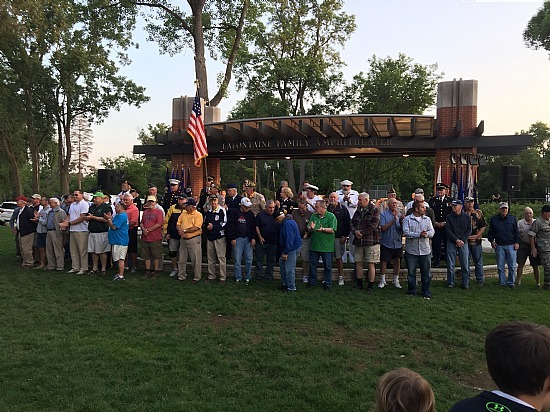 On a beautiful July evening the Motor City Brass Band presented their annual patriotic concert at the new Lafontaine Amphitheater in Central Park. 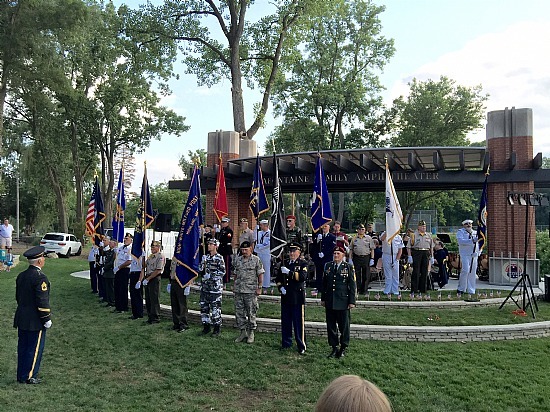 The opening ceremony featured a joint Color Guard consisting of veterans from American Legion Post 216, VFW Post 9914, and American Veterans Post 2006. The overflow audience enjoyed songs and marches from all eras and conflicts that highlighted and honored the contributions of all Americans. A special tribute was given to VFW Post Commander Tom Oltesvig who left high school early to serve in Vietnam, and upon return received his diploma. At the end of the performance all veterans in the audience were invited down front as the band and vocalist presented a rousing rendition of Lee Greenwood's "God Bless the USA." Thanks to all who coordinated and planned this great event.